Our members have been involved in fulfilling our mandate since 1985 in an inclusive and diversified manner. 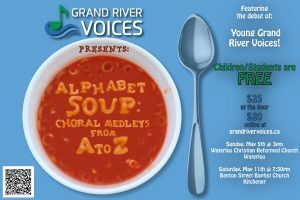 Grand River Voices are a community choir based in Kitchener, ON. We offer musical growth and performance opportunities for any voice type and any level. Our rehearsals run weekly on Wednesday evenings at Calvin Presbyterian Church (248 Westmount Rd.) from 7 – 9:30pm. Are you interested in joining our choir? Please contact us! Yes! I’d like to join!